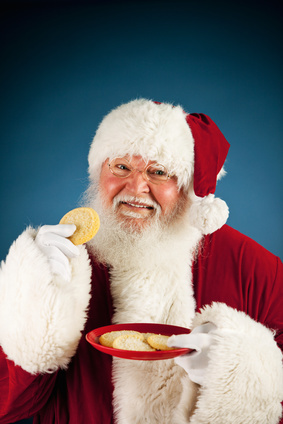 talkhealth > Blog > 2015/12 > Does Father Christmas Have IBS? It was six o’clock and I wanted to go home when the nurse came in and announced I had one more patient to see. I thought I’d seen the last one, I complained, my heart sinking. I’m sorry she said, but this one’s a bit special. In truth, he didn’t look well. He shuffled in, an elderly man dressed in a fur coat, red in the face, wheezing and grossly overweight He deposited an enormous bag on the floor, sat down, leaned on the desk and stared at me with watery eyes. ‘It’s all too much. I just can’t cope any more’. I asked him to explain. He was trying to do too much. At his age, he shouldn’t be trying to climb down chimneys, most of which were blocked off anyway. And then there was the stress of deadlines, the fear of letting people down. It was little wonder that his guts were all twisted up in knots. He nodded. ‘I just can’t let them down. You see, I never had anything when I was young’. He stared at me and sighed. Dr Nick Read is a gastroenterologist, nutritionist and psychotherapist, and chair and medical adviser to The IBS Network, an independent charity that supports, informs and advises people with Irritable Bowel Syndrome (IBS) and facilitates the concept of self care of IBS in the community. For more posts, check out his blog on www.thesensitivegut.com.